From History of the County of Schenectady, N. Y., from 1662 to 1886. Howell, George R. and John H. Munsell. New York: W.W. Munsell and Co., 1886, p. 147-149. The Manufactories and Industries of Schenectady. 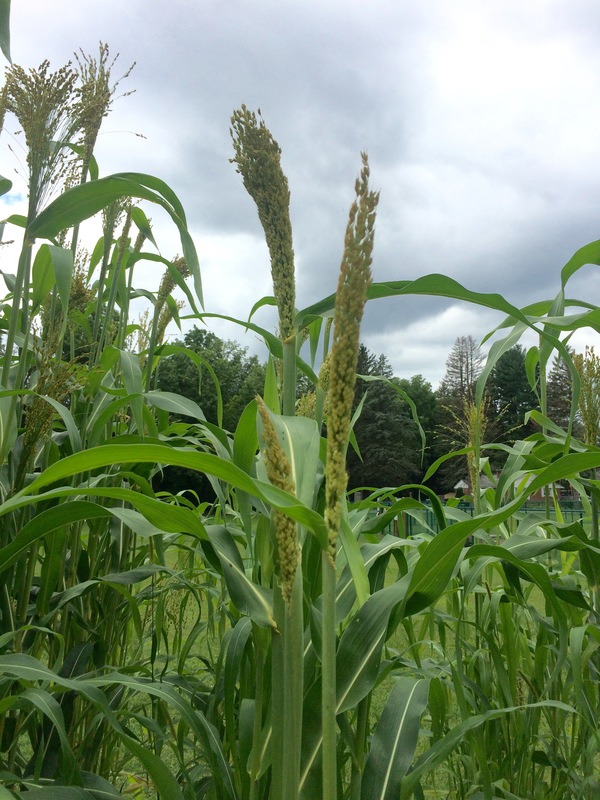 Broom Corn.—For half a century Schenectady County produced more broom corn than any other in the State. The New York “Gazetteer,” of 1860 and 1872, states that one-half of the entire crop of the State was raised in the county. The introduction of Western corn has reduced the acreage of 1,500 acres, which it was up to 1880, to one-third that quantity. There will not be over 500 acres planted this year—1885. The soil has become somewhat exhausted by this long repeated work, and land that formerly gave 900 pounds to the acre will now produce only 550 pounds. The history of this interest is a large factor to a proper commercial knowledge of our county. While the industry shows a marked decline from its former condition, it is yet one of the largest of its kind in the State. As all old citizens will remember, the broom of former days was a rude device compared with that of to-day. 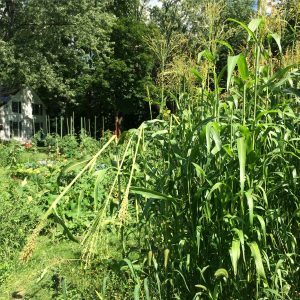 It was simply a few round bunches of corn sewed on to a stick. George Canfield, who came here from Utica about fifty years ago, was the inventor of the improved “Shaker” broom, the flat broom we now use. Mr. Canfield also invented, about 1850, a seed planter, planting previously being done by hand. He also, ten years later, made a horse planter, which is yet in general use. Mr. Canfield never protecting his contrivances by patent, met with the usual result of inventors, and died a poor man. The Pioneer.—The very first grower in the county was Otis Smith, who came here from Connecticut over fifty years ago. A Mr. Willard, who owned a farm at the west end of the town, had planted two acres on the island. This was the first land ever planted to broom corn on the Mohawk River. After preparing his land, Mr. Willard, not himself a practical corn grower, sent for Mr. Smith to superintend the crop. Smith purchased land until he owned about 125 acres, and raised and manufactured corn until his death in about 1870. The following list gives the best information attainable of the pioneers in this industry, beginning on the north side of the Mohawk River at Schenectady, and running thence to Hoffman’s Ferry, a distance of ten miles. North Side of the River.—David F. Reese, fifty years ago, owned the islands a mile from the city, known as the Hook Islands. He had 200 to 250 acres, and up to about 1865, the year of his death, was a grower and manufacturer. After his decease, his son Frederick continued the business until his death, some seven or eight years later, when the farm was divided. Mrs. Frederick Reese now owns the Big Island, Hook Island belonging to the Collins family. Next west to the Reese farm, in Scotia, was that of Charles P. and Edward P. Sanders, who, forty-five years ago, owned 700 acres there, seventy-five of which were devoted to corn. They also manufactured and continued until about 1870, when they retired, though they still grow some corn. They belong to one of the old families of the county. The next farm on the west was that of 100 acres, owned by Col. Abraham Toll. He raised and manufactured from about 1840 up to about 1965, when his brother, Charles H., bought it and continued the business for ten years. He then gave it up and became a general farmer. Next west to the Toll place was seventy-five to eighty acres owned by Reuben Ellwood, who, from about 1845 to 1855, grew and manufactured corn. He then removed to Illinois, selling his property to Wm. Cramer, who, up to his death about fifteen years ago, as has his family since, remained in the same business. Cornelius and Nicholas Velie had fifty acres, next west to Ellwood, forty-five years ago. Up to about 1860 they grew and manufactured, when they died, Wm. Haslow becoming owner of the farm. He has continued the business ever since. Next west of the Velie property was that of Nicholas Brooks, who, forty-five years ago, owned sixty acres there. He grew and manufactured corn for about five years, when David F. Reese rented the farm. In about 1855 Harvey Vedder leased it, and in 1865 Christian F. Seeley bought it. Through all these changes the corn business was kept up. The homestead is now owned by James Wyatt and the balance of the farm by Frederick Larbey. No corn is grown now. Garrett Barhydt owned fifteen to twenty acres, next west to Brooks’, thirty years ago, and from that time to date has grown corn. West of Barhydt’s, Wm. Rector began, in about 1845, with thirty-five to forty acres. Has never manufactured, but continues the raising of broom corn. For thirty years, ending in 1884 Adam H. Swart grew corn upon fifteen acres situate next west to the Rector farm. Next west to Swart’s are forty acres owned by John S. Barhydt, who, fifty years ago, was a grower and manufacturer there. Mr. Barhydt died in 1854, since then his son John has run the farm. He has a manufactory in the city. Forty years ago Aaron Swart raised corn upon 20 acres next west of Barhydt’s. He made a few brooms at first, but soon gave it up. Mr. Swart sold out to Latin Johnson in 1866, and moved to Illinois. Mr. Johnson raised corn until 1884. Next west to Aaron Swart’s is the estate of Philip Vedder, who owned it a century ago. In 1845, Albert H. Vedder began growing corn upon from 40 to 50 acres of the original 150-acre farm. In 1863 he sold 80 acres to Nicholas H. Swart, including the land he had been working. Mr. Swart remained there until 1866, when he sold to Cornelius Van Patten, a grower. Mr. Van Patten died in 1883, leaving the property to his daughter, who shortly afterwards sold it to Bartholomew Clute. No corn is raised there now. South Side of the River.—Beginning at Schenectady, on the south side of the river, are the Watervliet Shakers, who, when Otis Smith harvested the first two acres above described, were making preparations to cultivate and manufacture corn in this county. They came here from New Lebanon, and were the first to make brooms for the Schenectady trade. They leased the Tomilson farm of 90 acres. They already owned—and still do—60 acres two miles up the river, making, with the Tomilson property, 150 acres, which they planted to corn. Nicholas I. Schermerhorn was their superintendent from 1835 for forty years. In 1850 the Tomilson portion was sold to John Myers, who grew and manufactured up to the year of his death, about 1870. He was a large operator. After his death his family rented the land and manufacturing was stopped. The 60-acre piece was recently leased to John Van Epps. Nicholas I. Schermerhorn, from about 1840 to 1880, had 90 acres where the Jones Car Company is now located. Mr. Schermerhorn was a large grower, manufacturer and dealer. He bought for years about all the corn grown in Schoharie Valley. Next west to the Schermerhorn property, fifty years ago, John, Alexander and Jacob Van Epps had 200 acres of land and grew and manufactured. In about 1860 the Van Epps’ sold a part of the farm to John Veeder. John Myers subsequently bought out Mr. Veeder, and after the death of Mr. Myers his family continued to grow corn, but no longer manufactured. Jacob Van Epps died about 1860, and John Van Epps, 1868. Alexander now lives in the city and still raises corn upon the homestead, though no brooms have been made there since 1863. Two brothers, John and Simon Schermerhorn, fifty years ago owned 50 acres next west to the Van Epps’ home, and from that time to date have grown corn and made brooms. Fifty years ago, Nicholas Vrooman and Josiah Van Patten owned 150 acres next west to the Schermerhorns, upon which corn was grown. Forty-five years ago, Nicholas also owned 25 acres there, upon which he grew corn and made brooms until 1880, when his son succeeded to the business. Josiah sold his land to Lewis Clement in about 1873, and is now living in the city. 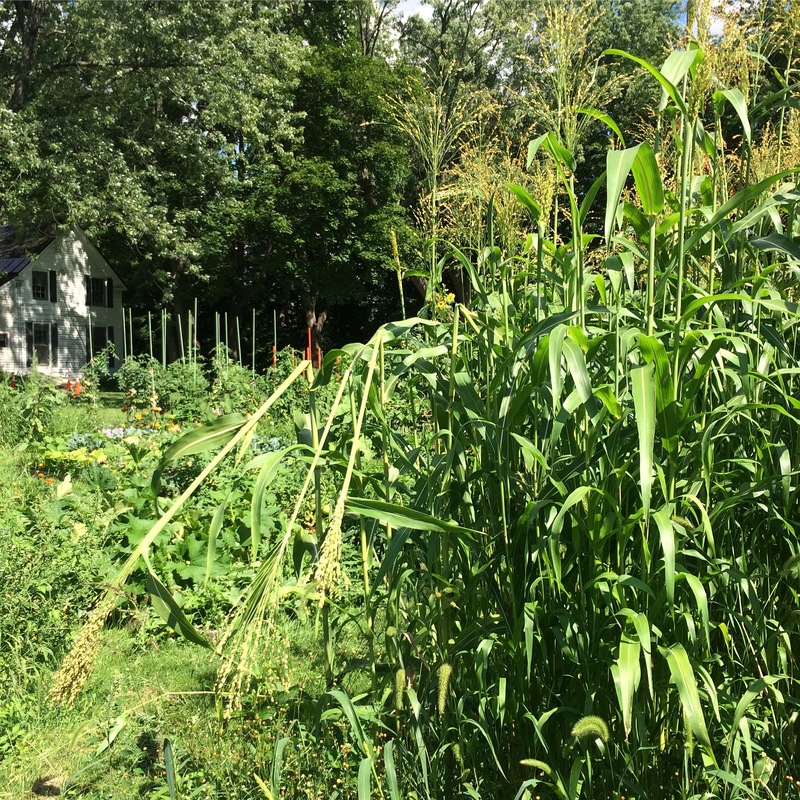 Mr. Clement grows corn. Vrooman Van Patten is yet living on his farm, his son, Abram, growing corn and making brooms there. Next west to Van Patten’s, forty years ago, Anthony H. Van Slyke owned 50 acres. He died in about 1865. Corn was cultivated and a few brooms made. His sons, John and Harmon Van Slyke, own the farm, and until 1882 grew some corn. In that year they leased the land, upon which corn is still cultivated. Abram A. Bradt, next west to Van Slyke’s, in 1845 cultivated 25 acres; he also made brooms. After his death, in about 1882, Harvey Bradt took possession and in 1883-4 corn was grown. From 1870 to 1883, Harvey Bradt had quite an extensive manufactory in the city. In 1835, Simon Maybee, next west to Bradt’s, cultivated 15 to 20 acres, continuing until about 1870, the year of his death. Jacob Maybee then grew corn there for about five years. In 1845, Aaron Bradt cultivated 30 acres next west to Maybee’s. He died about 1860, and Francis Bradt grew corn and made a few brooms. Next west was the 35-acre piece of Abram N. Bradt, who, in 1835, grew corn there. He died in about 1880. And was succeded by his son, Simon Bradt, who continued intil 1883, the year of his death. The property was bequeathed to his nephew, Abram. A. Bradt, who now lives there and grows some corn. Nicholas Bradt has cultivated twenty acres next west for fifty years, and is yet living there. John M. Veeder raised corn upon thirty acres next west, from 1857 to 1882. He also made a few brooms, but is now out of the corn business. Next west to Veeder’s farm, and the last on the ten-mile track, is the thirty-acre farm of John Byce, who began raising corn there twenty years ago. He also makde a few brooms, but in 1883 retired from the business. The farm is still his home. Nicholas H. Swart has been a buyer and seller since 1835, and since that time has dealt with nearly every prominent grower in this section. Mr. Swart shipped the first load of broom corn ever brought from any Western State to this city. This load was from Illinois, in the year 1852. We are indebted to Mr. Swart for a recital of many of the facts given in this araticle, and to his remarkably clear memory any credit due to its accuracy should be given. H.J. Ansicker, Water street, corner Washington avenue, house 3, Ferry, continued; John Barhydt, 21 Washington avenue; Henry Bradt, broom handles, Mill lane; H. S. DeForest, 100 Centre street; Charles Horstman & Co., 6 River; D. F. Rankins & Co., 121 Front street; Henry Whitmyre, 19 North street; Chas. L. Whitmyre, 12 and 14 Washington avenue; Christopher Van Slyck, 7 Pine and 57 Centre street; James A. Flinn, John street. An interesting story about the celebrations of Independence Day in Schenectady and Scotia appeared in The Schenectady Cabinet, the weekly local newspaper, in June and July, 1830. The excitement appeared in three separate issues of the paper, and I’ve transcribed it here. Italics and capitalizations are original. If you want a quick read, the highlights of the proceedings are in bold. But then you will miss the incendiary prose, the expressions of controversy, the attention to detail, and the texts of the 17 (!) toasts. Chairman of the Committee for this alternative celebration was Capt. Reese, who was the owner of the present Flint House. As you read, remember that 1776 and the Declaration of Independence were only 54 years ago for those folks. That’s like 1962 for us, so most everyone there had a personal tie to the events of the Revolution. Either they experienced it themselves or they had heard the tales from their parents or grandparents. At a large and respectable meeting of the citizens and townsmen of the city and county of Schenectady, held at the house of Bernard Cramer, in the village of Scotia, in the town of Glenville, on Saturday the 19th June, 1830, the following preamble, resolutions and proceedings, were unanimously adopted—Capt. Reese, having been first called to the chair, and Capt. Caw, appointed Secretary. Resolved, That on the ensuing anniversary of our National Independence, we will come out from the city, because of the diversity of feeling and sentiment existing among the people, and on this side of the Mohawk, with a unison of feeling, with one spirit and as one man, celebrate the proudest day in the annals of history, in peace and with good feelings of friendship towards all mankind. Resolved, That we consider it the exclusive right of a free people to rule themselves, and that we disapprove of being ruled by a corrupt and unprincipled aristocracy, who only seek popular favour and the aggrandizement of their own wishes, without regard to honor or the dictates of a good conscience. Resolved, That we consider liberty of expression and liberty of action, heaven’s first and best gift to man, and an invaluable blessing secured to us by our admirable constitution. Resolved, That we will act free and independent, and according to the dictates of a good conscience, enlightened by the reflection of reason, and that we will not show ourselves unworthy of the privileges emanating from a republican government. Resolved, That we do most heartily disapprove of the course adopted by the relics of the Regency, in its full extent, and also in all its ramification: that we will no longer suffer ourselves to be betrayed by a kiss: that the veil having been withdrawn from our eyes we will see! and fearlessly express our sentiments. Resolved, That the Lion having been attacked in her den and laid at our feet, we will not be alarmed at the mewing of her whelps. Resolved, That he who will tamely submit to wear the shackles of servitude in a land of liberty, ought to be despised and is unworthy the name of a man. Col. Consaul, Maj. Sanders, Adj. M’Clelland, Qr. Master Bouck, Pay Master Allen, Serg’t Wemple, Qr. Master Faling, Capt. Reese, Capt. Bath, Capt. Caw, Capt. Garnsey, Capt. Lawrence, Capt. Clogston, Capt. Toll, Capt. Cramer, Capt. Knight, Capt. Condey, Capt. M’Allister, Capt. Van Slyck, Lieut. Brumaghim, Lieut. Marselus, Lieut. Veeder, Lieut. Ulsaver, Lieut. Carner, Ensign Carner—Judge Sanders, John I. De Graff, John Anderson, jr. , John Lassells, Geo. M’Queen, Aaron Van Santvoord, Simon Swart, Peter Sanders, Barent Sanders, Russel Waterman, Andrew Yates, Judge Potter, John Worden. Adjt. M’Clelland, for Deputy Marshall. A committee of three were appointed to wait upon the above gentlemen, to solicit their acceptance of their respective appointments. After a number of sub committees were appointed to attend the necessary business preparatory to the celebration, the following resolutions were adopted and the meeting adjourned until Monday evening the 21st instant. Resolved, That the Oration be delivered, the Declaration of Independence read, and the usual exercises of the day, be had in the Reformed Dutch Church of Scotia. Resolved, That the citizens of Schenectady, and the Military of the city and county of Schenectady, are respectfully invited to participate with us in the celebration of our next national anniversary of Independence, and that the proceedings of this meeting be signed by the chairman and secretary, and published in the Schenectady Cabinet. DAVID F. REESE, Chairman, James Caw, Jun. Secretary. Capt. Garnsey’s company of Flying Artillery, commanded by Lieut. J. A. Brooks. Capt. Rees’ company of Heavy Artillery. Capt. Bath’s company of Light Infantry. Capt. Caw’s company of Light Infantry. Military Officers in full uniform. Revolutionary Officers and Soldiers with their Banners. Orator, and Reader of the Declaration of Independence. The Trustees of the town of Glenville, together with the Officers of the town, attended with their company and their staff. Judges and Magistrates, preceded by the Constables with their insignia of office. Faculty and Students of Union College. The procession being thus formed, will move down the dyke to Mr. Swart’s, opposite the Mohawk Bridge, and from thence to the Dutch Reformed Church at Scotia, where an Oration will be delivered by John Brotherson, Esq. and the Declaration of Independence read by Capt. Caw. The Trustees of the Town on the stage. The Officers and Soldiers of the Revolution will occupy the first and second seats fronting the stage. The Military Officers the 3d and 4th seats fronting the stage. The Judges and Magistrates the east half of the lower floor. The Ladies the west half of the seats on the lower floor. The singers the front seats in the gallery fronting the state, and the martial music the 2nd and 3d seats fronting the gallery. Capt. Garnsey’s company, commanded by Lieut. Brooks, and Capt. Rees’ company on the west side of the gallery. Schenectady Volunteers in the rear of the martial music. Capt. Bath’s company and Capt. Caw’s company, the east side of the gallery. 1st, Music—2d, Prayer by the Rev. Mr. Murphy—3d, Music—4th, Declaration of Independence—5th, Oration—6th, Music—7th, Prayer—8th, Music. The exercises of the day having been concluded, the procession will then form as before, and proceed to the banks of the Lake, where the National Salute will be fired, consisting of 26 guns, and from thence the procession will move to the house of Bernard Cramer, where a sumptuous Dinner will be provided. The bells will continue ringing while the procession moves. An evening gun will be fired at 9 o’clock. Col. Benson is appointed Marshal of the day, and Lieut. Brooks Deputy Marshal, each of whom are to be obeyed accordingly. No person will be allowed to enter the Church before the procession, except Ladies. A committee of arrangements have been appointed, who will cause the most strict observance of order on that day. No expense or labour will be spared to render the proceedings both convenient and agreeable. The Church will be decorated with greens and shrubbery. The resolutions which appeared in last week’s Cabinet, were not intended for any Regency, or the relics of any Regency existing out of the city of Schenectady, although they who are so blind they will not see, would fain shake it off of their own shoulders and load it on that of the Albany Regency.—The latter have as much as they can stagger under already, without bearing the burden of others. The celebration at the village of Scotia, of the late Anniversary of American Independence, exceeded the expectations of all present; not only in the largeness of the procession, which extended from the Mohawk bridge to the village of Scotia, but in the exercises of the day. Little more than one half of the large assembly of people, were able to crowd themselves into the church, although it was well prepared for the reception of the audience—the decorations were arranged with elegance. The windows were literally crowded with people; and through the whole exercises the profoundest silence was observed.—Among the audience were a number of the faculty and about sixty students from Union College. Capt. J. Caw, Jr. read the Declaration of Independence, with emphasis; his introductory remarks were pertinent to the occasion. And we deem it a duty we owe to John Brotherson, Esq. the Orator of the day, (notwithstanding his solicitation) to say, that the oration delivered by him (which occupied near an hour) was creditable to his talents. By J. Fonda. The day we celebrate—May all nations in future observe a jubilee in commemoration of having regained the right of self-government. By A. Vrooman. The twenty-six United States of North America—May their union prove perpetual and their happiness everlasting. By Judge Sanders. North and South Columbia, twin sisters—May their affection for each other become as strong and durable as the isthmus that unites them. By J. Lighthall. The fair daughters of the twin sisters—May they never bring forth a tyrant. By A. Updyke. Our brethren of Great Britain—May their condition be ameliorated, and their taxes and burthens diminished, that the poor may enjoy comfort. By W. Veeder. Andrew Jackson—May his administration prove a blessing to his country. By D. Pryme. Greece by her struggles has merited the right of self-government, yet unfortunately she is constrained to bend her neck to the defenders of legitimacy. By C. Haverley. May the American Eagle never be trodden under foot. By H. Reese. When the revolutionary soldiers shall sink into the ocean of eternity, to rise no more, may their spirits be deeply planted in the bosom of the rising generation. By P. Brotherson. The Dutch—may they always support those principles which were imported with them, truth, honor, economy and a love of country, and may they never be poisoned by the filth which flows from the warmth of party zeal. By P. H. Brooks. The memory of General WASHINGTON. By B. Sanders. The Navy of the United States—With equal force the superior of the world. Success to the lover, and freedom to the slave. By J. Brotherson. Health to Gen. Jackson, but success to Henry Clay. Till sun shall want and time shall be no more. By J. Sanders. Maj. Fonda, the man who first raised the flag inscribed “Liberty of Death,” in the city of Schenectady. Gentlemen of the Committee—I thank you for the honour you confer upon me, by your personal attendance and soliciting the feeble production of him who now addresses you, for publication. Were not your solicitations necessarily associated with accompanying circumstances, they should be complied with, on my part, with cheerfulness. But matters being as they are, it makes it rather delicate for me to cast the first torch amidst the darkness which blinds the eyes of too many of our citizens. For the present, therefore, I decline having any farther publicity given to the oration. I will assure you, however, and wish it expressly understood, that it is not owing to any apprehension on my part, that it will not withstand the light of truth, although it should shine forth on every word of it; but it is because I feel a kind of compassion for some persons lest the truth should injure their feelings, before it would reach their understandings. It is not surprising that wholesome food should be obnoxious to the stomachs of those who are accustomed to swallow adulation, as water mixed with a few grains of deceit, and double that quantity of hypocricy [sic]. Yet should the truth operate on them as an emetic, it will not injure their constitutions; but on the contrary, have a tendency to cleanse their foul stomachs. And although it may debilitate their persons, during the operation, the medicine is a simple one and can surely hurt no one, but will eventuate in producing a salutary effect on their systems. Although it be a maxim, that the truth should not always be spoken, yet when applied to the interests of the public, the maxim should be without an exception, although it should place him of whom it be spoken in ever so odious a light. And they who support a different doctrine, are supporting a tenet which if carried to its full extent, would, by degrees, draw from under our government its foundations and lay the basis of a despotic government, of which falsehood, secrecy and the will of the despot, are the characteristics. I cannot reconcile a doctrine which would exclude the truth from the vision of the public, with that virtue and morality which are essential to the support of a republican government. Freedom of sentiment and the honest expression of truth, are the only sure defence [sic] against intrigue and corruption, which, if not guarded against, will most assuredly creep into the heart of our country and there gnaw, corrode and poison, until at length our government will fall lifeless by the hand of such men as make great professions of friendship for the people, and particularly the yeomanry of the country. As it is customary to give newspaper puffs to all orators, who deliver 4th of July orations, perhaps you may be induced to puff me. I beg that you will not do so for two reasons: the first of which is, that they who say much to the credit of another, on such occasions, are not apt to speak the whole truth. The second is, that the only object in being puffed must be to gain a little unmerited popularity and false praise, which are equally lavished on the meritorious and the unworthy; for which reason I shall consider it no compliment. Resolved, That the above proceedings be signed by the chairman and secretary, and published in the Schenectady Cabinet, and Albany Gazette.